Star rubies are extremely rare and are coveted by collectors and connoisseurs. These semitransparent to opaque stones vary in color from light to dark red or even purple red. Due to a phenomenon known as asterism – an effect caused by tiny needle-like inclusions reflecting and scattering light within the stone – star rubies usually display a star with 6 rays. The star will appear to glide across the stone as the stone is rocked gently back and forth. Special care has to be taken in the cutting of these cabochon rubies to maximize the star’s appearance. The star in the cabochon ruby I rendered suggested a web to me, so I decided to make the ruby into the body of a spider. Much like the markings on a Black Widow spider, my spider is also marked (with the star) and has a slightly edgy vibe to it. 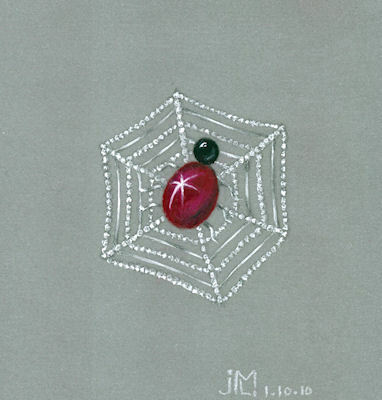 I chose to offset the blood red vibrancy of the ruby with a diamond web – much like dew drops on a foggy morning.